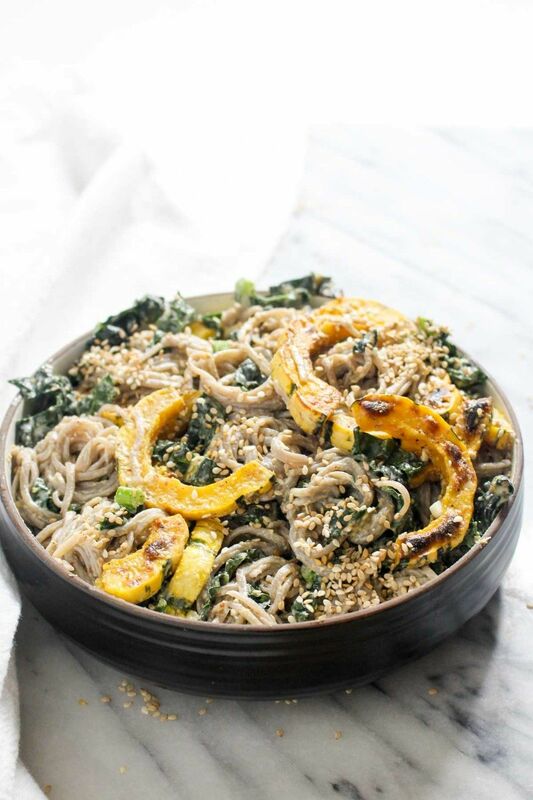 This healthy 9 ingredient Soba Noodle Salad is coated in a creamy and nutty tahini dressing and studded with caramelized winter squash and fresh kale. Preheat the oven to 450 degrees. Toss the delicata squash with the avocado oil and a pinch of salt and pepper. Roast for 20 minutes. Remove from the oven and set aside. Fill a pot with water and a large pinch of salt and bring to a boil. Add in the soba noodles and stir. cook until tender, stirring occasionally, about 6-10 minutes. Reserve 1/2 cup of the pasta water, then drain the noodles and rinse them with cold water. Set aside. In a small bowl, stir together all of the dressing ingredients. Toss the noodles, with the dressing, squash, and kale. Add in the reserved pasta water if needed to loosen the sauce. Serve.